This is not a true Rookie Card of Acuna if that is what you are looking for. His official Rookie Card will likely be issued shortly after he makes his Major League Debut. 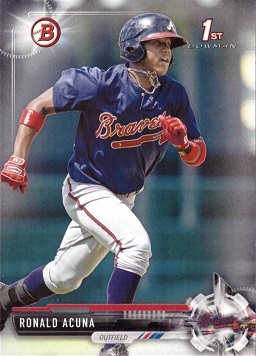 This card is, however, his first Bowman card, which many collectors treat like his Rookie Card because it is the first Major League licensed trading card for Acuna. This card is 100% original and authentic and was produced in 2017 by Bowman. Bowman cards are made by Topps.